I was always under the impression that muffins were just a way of eating cake for breakfast, not that I have a problem with that. 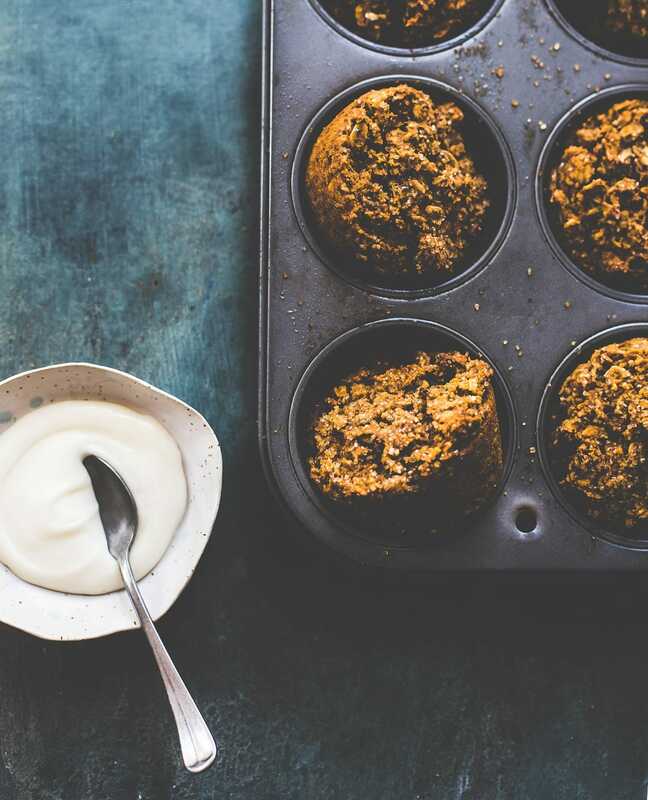 And then there are the muffin recipes I’ve tried that were coined “wholesome/heart healthy/free of this and that” — ya, I haven’t found one that I’d feel good about delivering to neighbors, which is one of my guiding judgements. Often, they’re overwhelming banana flavored, and turn out too dense or soggy in the middle. 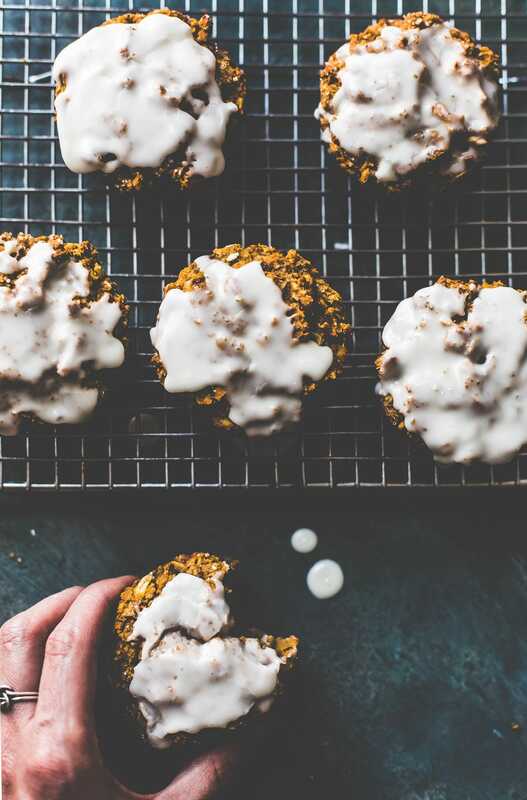 These soft and tender sweet potato muffins are the opposite of all those things. Warmly spiced, scraggly tops, delicate crumb, and a drippy vanilla glaze to tempt. And yes, healthy. I’m so confident anyone would love them, that I’d happily deliver a dozen to the toughest critics, and doubt anyone would guess they’re vegan and gluten-free. 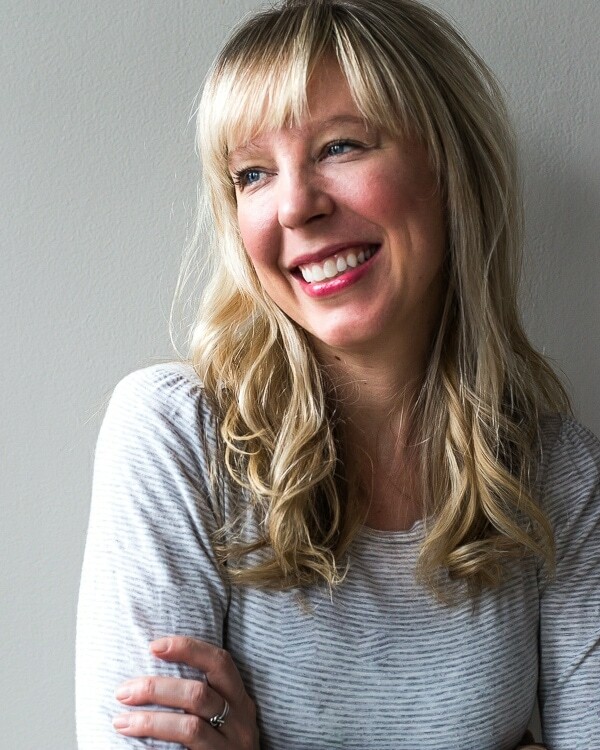 Most of you know that I’m not vegan, or vegetarian for that matter, but I love alternative ways of cooking, a challenge, and providing recipes for the diversity of people who visit this blog. 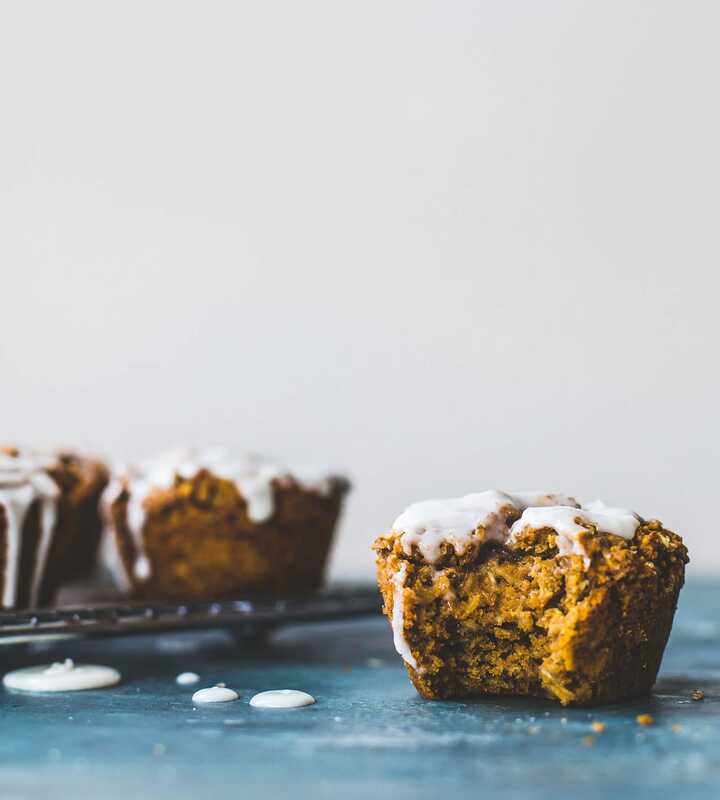 I sought to make these healthy sweet potato muffins without dairy of eggs, and after several tries, the recipe came together perfectly. 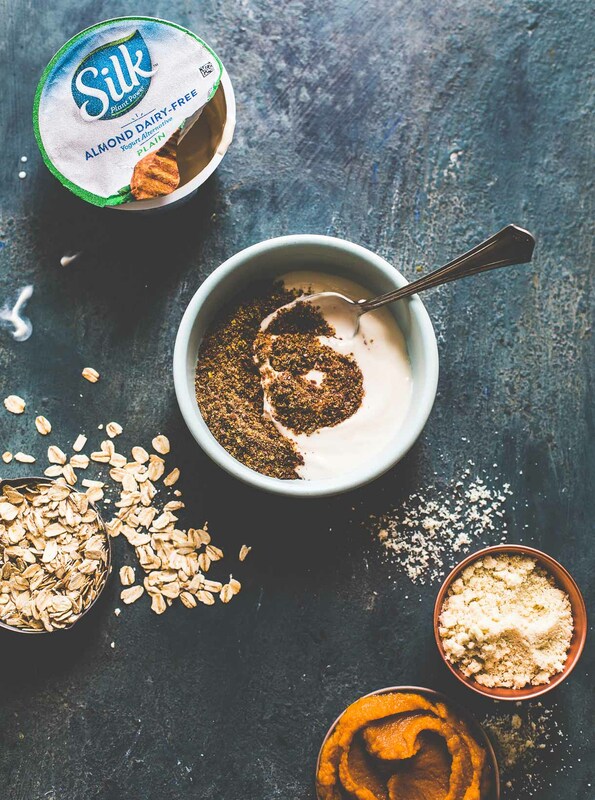 I used Silk’s new almond-based yogurt mixed with ground flax seeds to replace the eggs (turns thick and sticky after absorbing), and olive oil, maple syrup, and sweet potato for the rest of the wet ingredients. The dry ingredients consisted of oats, teff flour (my favorite gluten-free baking staple), and almond flour. Being a combination of grains and nuts keeps them light and tender. Of course the glaze is optional, but in my opinion, it makes these muffins extra special without much effort at all. Bakery shop worthy, I like to think. It’s simply powdered sugar thinned out with any plant-based milk and spooned on top. Healthy enough to eat for breakfast, satisfying enough to call a treat. The kind of snack you can proudly deliver, unless of course, they’re gone before that can happen. Follow Silk on Pinterest, Facebook, Twitter, and Instagram @LoveMySilk. And sign up to receive the Silk newsletter for free coupons and new product alerts. Preheat oven to 350 degrees. In a medium bowl, whisk together ground flax and yogurt and set aside for 10 to 15 minutes to thicken. Place 3/4 cup of the oats into a spice grinder or food processor and grind until you get coarse flour. 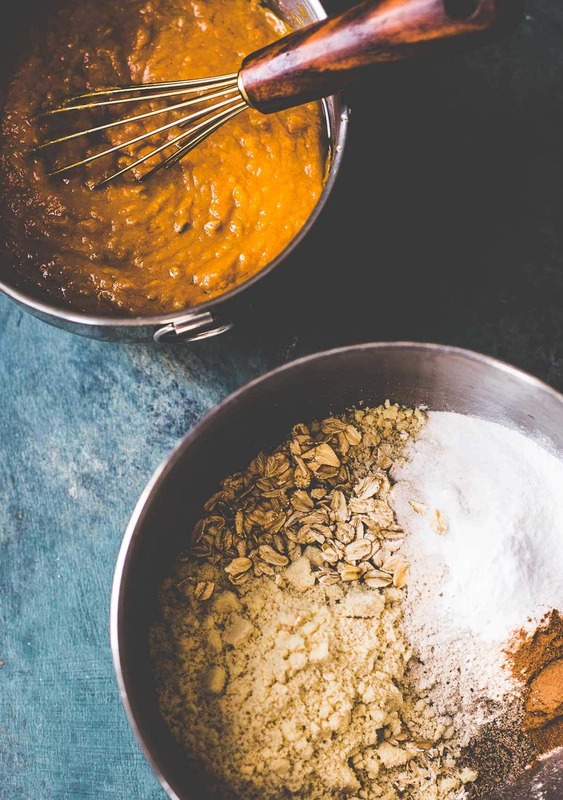 Place in a medium mixing bowl and add remaining ¾ cup oats, teff flour, almond flour, baking powder, baking soda, cinnamon, and salt. Stir to combine and set aside. Add sweet potato puree, olive oil, maple syrup, vanilla, vinegar. Whisk to combine and pour into dry mixture, stir until just combined. Grease 12 cup muffin tin with olive oil, and spoon batter into muffins. I usually get 8 full size muffins when I fill them to the top. Bake for 28-30 minutes, until a toothpick comes outs clean. Let cool in pan for 10 minutes, and use a knife to remove them by circling around the inside edges. 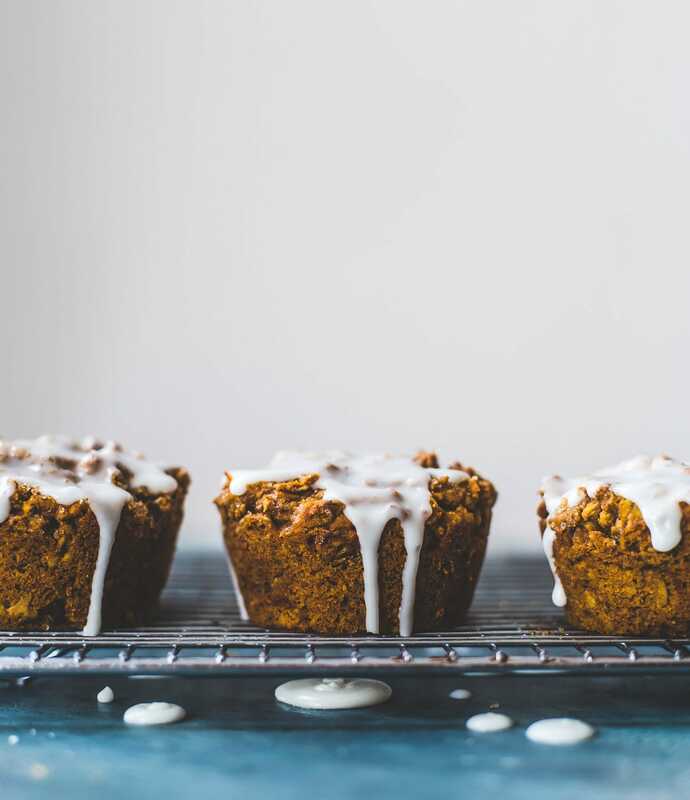 When muffins are fully cool, whisk icing ingredients together and lightly frost. The mixture might seem thick, but it changes from thick to runny quickly according to how much milk you add. Adjust as needed. 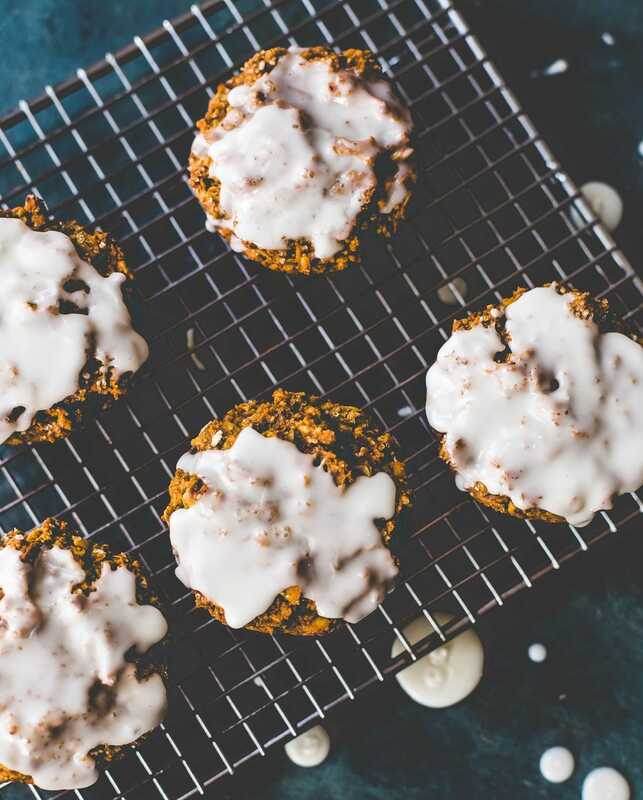 These look amazing – as a vegan I love that you are finding alternative ways to cook!! These are delicious! The texture is perfect and I love the sweet potato with the spices. 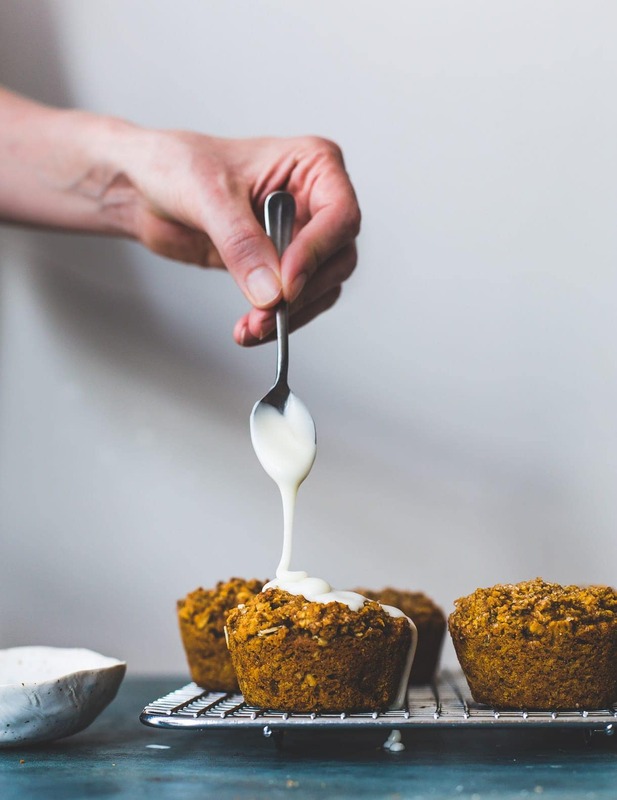 Can’t wait to have one for breakfast drizzle with coconut butter – yum!